Would you like freshly filtered water 'on tap' with these great products you can have access to bottled water quality for under 2p per litre! Improve the taste & odour of your drinking water. 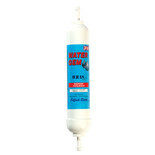 The water filters are easy to install with no plumber required.